The winner for the Spiral Light Painting Photography contest for March is Antonio Martinez for this awesome spiral light painting! Antonio shared this about his winning creation! 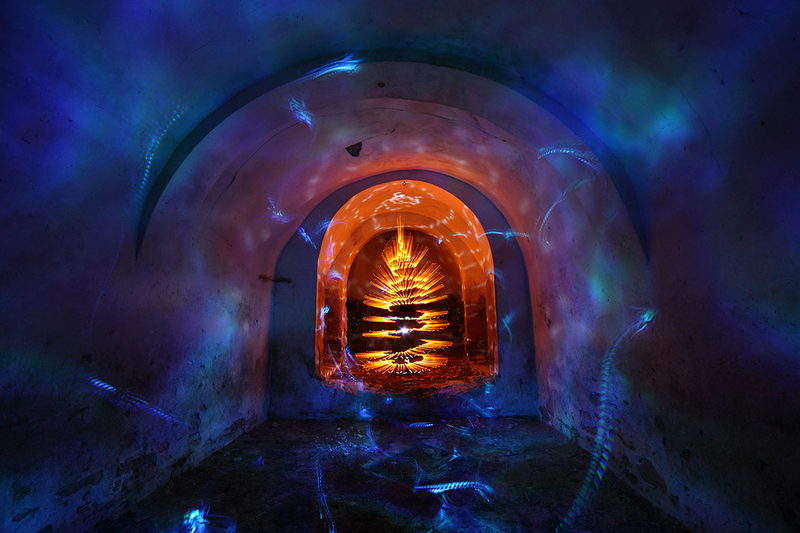 This photograph was made in a cave cellar that gives a lot of play for light painting with those arches! It is in the town of Jumilla, in the southeast of Spain. That night I had the company de Melisa Lefebvre, who was visiting Spain and we got together to go out and create some light paintings that we are both very passionate about creating! To create this image I combined a spiral inspired by Jason Rinehart, in warm color with a small orange tube. Then I illuminated a warm orange light using a cardboard to cover the source of light and illuminated the cave in all directions, to create a glow around the spiral. Finally I ended in a colder blue color, I used the method of lighting that I called “A Roales”, playing with a kind of strip curtain around the light and covering parts of it. While covering parts of the light only some parts of the walls are illuminated and it also creates some traces of light in the air that accompanies the main effect well, and that also filled in a little more of the empty spaces. Thank you very much everyone for the votes, and the judges for finally choosing my photograph! You can check out more of Antonio’s Light Painting work on his website here! For this winning Antonio will receive a prize package filled with light painting tools from our sponsors COAST Flashlights, and Light Painting Brushes ! Please support these awesome companies that support our light painting art from, without them this contest series would not be possible! If you would like to enter the next Light Painting Photography contest click here for all the details. Congratulations Antonio!! the lighting is superb and the final image really awesome! Congratulations Antonio, well deserved, I had wondered what you had used to light the foreground, thank you for sharing your techniques.